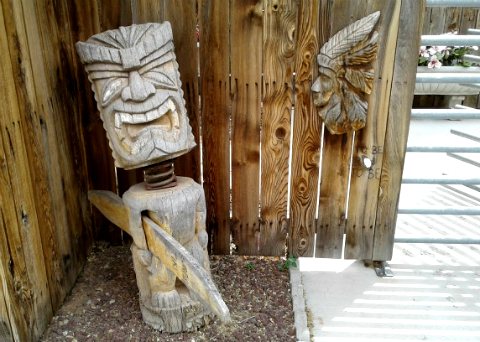 After finishing another house-sitting job, I was heading from Grand Junction, Colorado to Albuquerque, New Mexico. 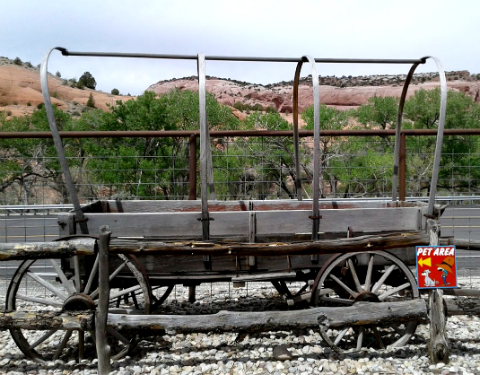 I decided to swing out through Utah to see the sights. On Hwy 191, approx. 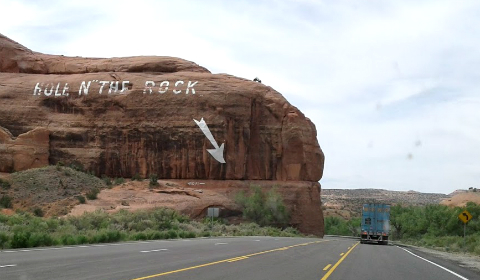 12 miles south of Moab, Utah, a big white arrow and the words HOLE N” THE ROCK painted on the side of a red cliff caught my attention. Follow the arrow, it’s just around the corner! 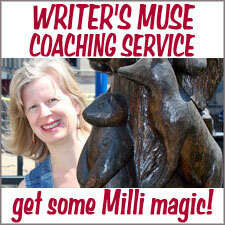 I parked in front of the General Store and thought about getting some ice cream. The first thing I noticed were these unusual Jeeps: one had camo as its color scheme and the other was made out of license plates. Turns out the camo Jeep belonged to some tourists visiting from out of state. Because of the rugged desert terrain (perfect for four-wheelin’), you see a lot of Jeeps and dune buggies around Moab. This was one of the more unique. 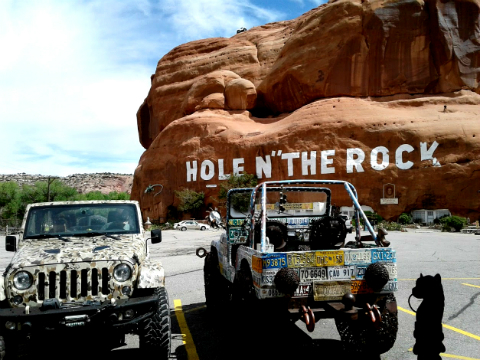 The other Jeep is a permanent fixture at Hole N” The Rock. 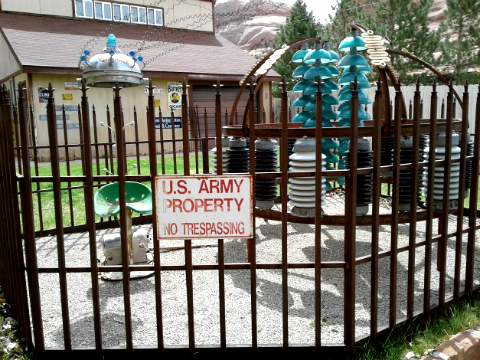 It’s a piece of metal art created by Lyle Nichols of Palisades, Colorado. 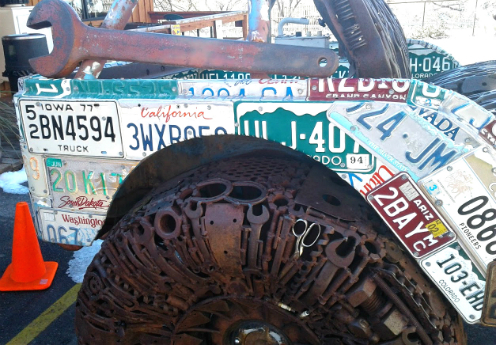 The tires, seats and other fittings are made from rusty scrap metal—everything from nuts and bolts, horseshoes and bicycles chains to scissors and a giant wrench. A fun contest was held to name it. From 17 honorable mentions my favorites were: Jeepenstein, Poetic License and Steel Crazy After All These Gears. When I walked over to the head of the rock to see the lizard, I decided to venture a bit farther around the front of the rock—which is right on the highway so probably most visitors don’t think of going there. 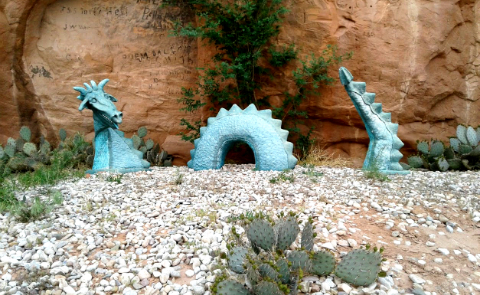 I was rewarded by finding this desert dragon. 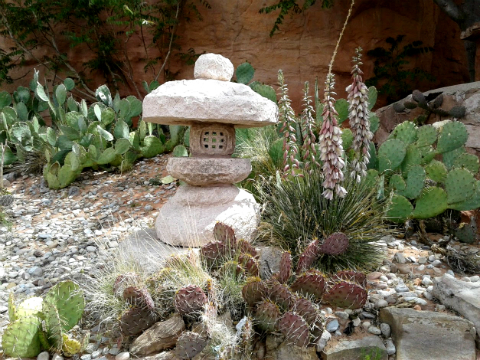 Not far from the dragon is a cactus garden with a Japanese touch. 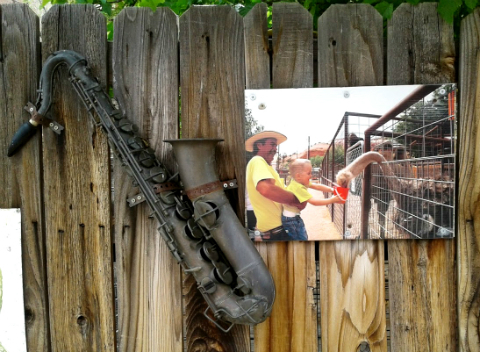 This is a recurring theme throughout the property: odd or unexpected pairings, such as the antique saxophone on the fence of the petting zoo. Billed as “A cast of characters performing daily!”, the zoo features emus, ostriches, camel, wallaby, miniature horse and donkey, pot-bellied pigs, horned Shetland sheep, baby doll sheep, pygmy goats, Angora goats, zebra, Watusi (modern American breed of domestic cattle, derived from the Ankole group of Sanga cattle breeds of central Africa and characterized by very large horns) and an aviary of exotic birds. 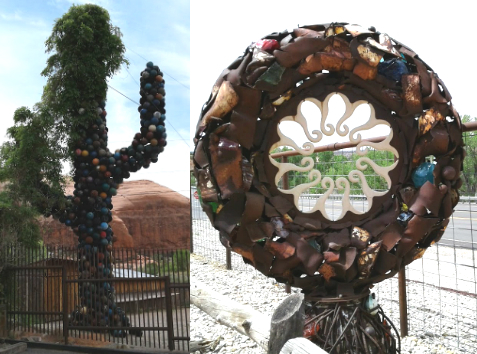 When you’re not feeding/petting the animals, rummaging through The Trading Post for locally made Native American pottery, jewelry and dream catchers, exploring the grounds or shopping for souvenirs and T-shirts, you can do a 12-minute guided tour of the world-famous Hole N” The Rock House. I didn’t get a chance to do the tour, but I peeked inside and saw one of the cave rooms. It was a kitchen that looked like it came straight from the 1950s, except that the ceiling and walls were chiseled and blasted out of the rock. The ceiling and walls were painted mint green, exactly the color you’d expect for a kitchen from that era. 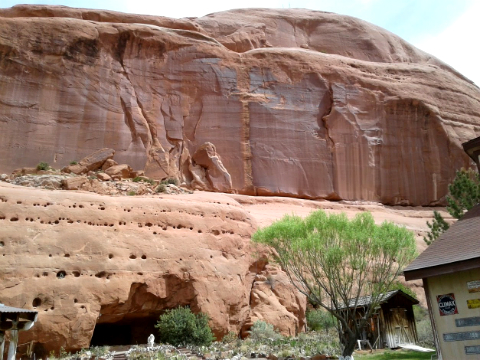 The first thing I learned is that the rock is Entrada Sandstone. Described by Wikipedia as part of the Colorado Plateau, this formation was deposited during the Jurassic period sometime between 180 and 140 million years ago in various environments, including tidal mudflats, beaches and sand dunes. I wanted to condense the history of this place for you into a snappy and scintillating overview, but that proved impossible. The history of the family who settled here and eventually blasted a home out of the rock is sprawling and complicated. It’s an 80-acre homestead site and the Christensen family settled there in the 1920s. The house in the cave started when the family wanted some bedrooms for their sons (they’d been sleeping in tents). 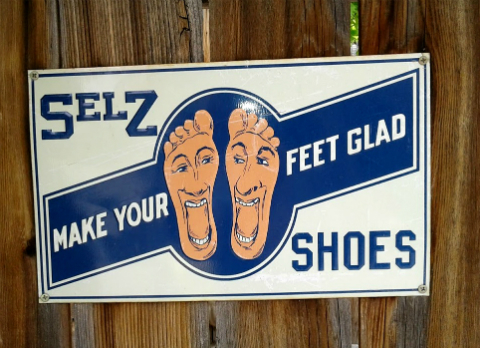 It was expanded over many years, and its development depended on the fortunes of the family—which were sometimes strained to breaking by the Great Depression, as well as some of the personalities involved. It was even affected by jail time served by one of the sons. While scratching out a living for his family making bootleg liquor during Prohibition, he was set up and betrayed by a party-goer. 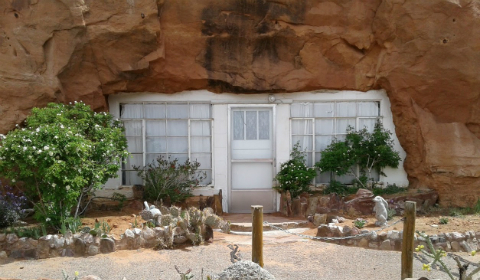 During part of its time supporting the Christensen family, Hole N” The Rock functioned as a diner and watering hole for uranium miners and locals desperate for fun times and some release from their worries and cares during the Depression, Prohibition and World War II. Ownership has changed hands at least twice since then. I’m guessing that some of the many oddities around the property were added later, in an effort to make it even more alluring for tourists to stay a while. 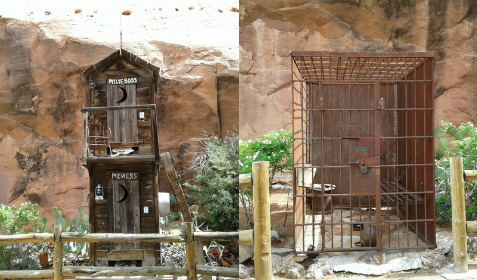 Some of the stranger features are so outlandish I could not make any connection between the cave house and the reason for the feature, such as this installation in the photo below. It’s billed as a way to get a new hair style, presumably by electric shock. 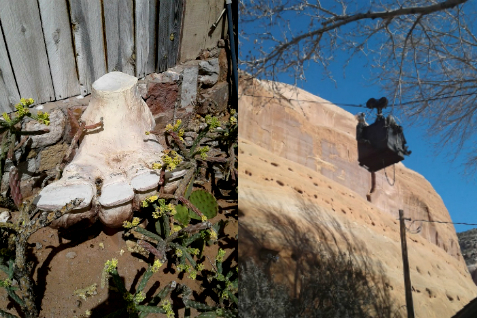 Another example of the whimsy to be found at Hole N” The Rock is a sign that promises a Big Foot sighting. I eagerly followed the footpath to the back of the property and found, literally, a big foot made of plaster of Paris, complete with hair on the toes. This was near an overhead miner’s trolley. I had to look twice when I saw a man inside the trolley. He looked so real. It was hard to do justice to this strange and splendiferous place with mere photos and the written word. 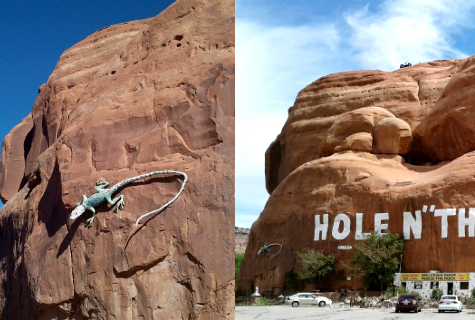 You’ll simply have to stop at the Hole N” The Rock next time you’re on your way to Moab, Utah or Arches National Park. Allow several hours so you can explore it properly and do the tour of the house. Find out more at theholeintherock.com. Wow. Just. Wow! That’s such a quirky place, and looks like a lot of fun to explore. I’ve noticed more and more, in many places, how people plop completely unrelated-to-the-period things to attract more tourists. Sometimes it looks actually interesting, like above! 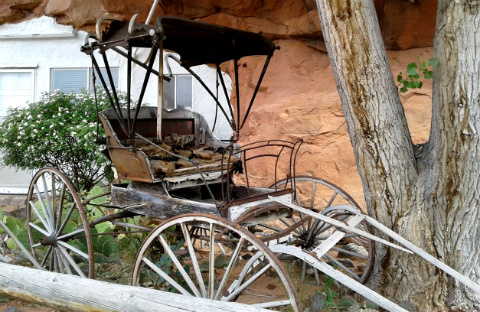 PS: My favorite pic from here is of the antique carriage! I’ve heard of Hole N’ The Wall, but I’ve never been there. This would be such a cool place for my family to visit. 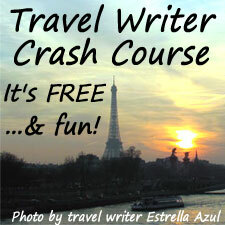 We ride motorcycles and this would make a great trip destination.